We've recently discovered one of the most distant extrasolar planets known to date. Or rather, NASA's Spitzer Space Telescope and Poland's Optical Gravitational Lensing Experiment (OGLE) have. Extrasolar planets (exoplanets) are planets that orbit stars other than our sun, and in the past two decades we have detected over 1,800 of them. Most of these alien worlds belong to stars in our galaxy that are relatively close to our solar system, but scientists have used different techniques for detecting and studying exoplanets at greater distances. The newly discovered exoplanet, called OGLE-2014-BLG-0124L, has about half the mass of Jupiter and orbits a star 13,000 light years from Earth, close to the crowded, star-rich central core of our galaxy. The observing campaign to find and study far-flung exoplanets like this one is aimed at giving us a clearer understanding of the distribution of exoplanets across the galaxy, and insight into the conditions under which planetary systems form. 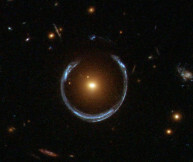 OGLE and Spitzer made the detection through "gravitational microlensing" observations, which take advantage of the situation when a star passes between us and another star. Diagram of a star and planet focusing the light of a more distant star toward on observer on Earth. Just as a telescope's glass lens bends and focuses light to produce a brighter image of a distant object, a star's gravity can do the same trick, but on a much grander scale. When a star passes between us and a more distant star, its gravity can bend and focus the farther star's light, causing a temporary increase in its brightness. If there happens to be a planet orbiting the intermediate star, its light also may be magnified and detected. Measuring the distance to this far-off exoplanet was accomplished by comparing observations made by an Earth-based OGLE telescope and NASA's Spitzer, which orbits the sun far from Earth. By noting the difference in the times of the lensing event as observed by OGLE and Spitzer, scientists were able to triangulate the distance of 13,000 light years—or 78 quadrillion miles! And by pinpointing the distance, the estimate of the exoplanet's half-Jupiter mass was also possible. Polling the population of exoplanets in the star-dense region of the galactic core adds to our knowledge of exoplanets both near and far, providing data to help answer questions like: are exoplanets more or less common in the galactic core, versus the spiral arms where our solar system resides? Scientists seek to explore how planetary formation may be influenced by a star system's location in the galaxy, so the more we know about the nature of exoplanetary systems in different regions, the better. 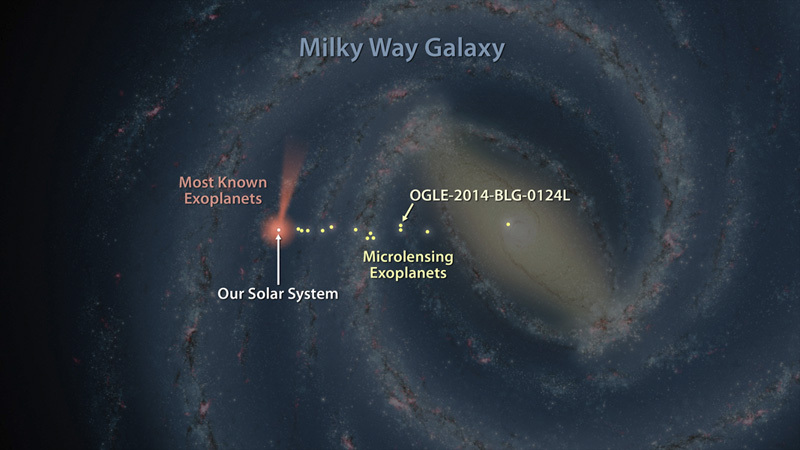 Microlensing detections made by a single observatory cannot always yield much more than an exoplanet's presence. A very distant star detected with this technique isn't normally visible, making the determination of its exact distance (and that of any planets it may possess) difficult to impossible. Of the 30 exoplanets detected through gravitational microlensing, the farthest being 25,000 light years away, we know the distance to only about half of them. Another factor in this type of observation is the chance nature of the star crossings, which we can only observe once for any given pair of stars. So, we may have only one chance to make a planet detection, with no possible follow-up observations. Still, the far greater concentration of stars in and near the galactic core provides many more star crossings and opportunities to make exoplanet detections. Closer to home, the more common techniques for finding exoplanets—either by measuring the wobble of a star caused by an orbiting planet or the dimming of its light when a planet transits in front of it—has yielded over 1800 confirmed worlds, mostly orbiting stars much closer to our solar system's neighborhood. NASA's Kepler space telescope, which pursues exoplanets using the transit method, is responsible for the bulk of those finds, as well as most of the detections of Earth-sized planets. At least 65 exoplanets have been confirmed within 50 light years of Earth—close enough for the television and radio transmissions that we began broadcasting in the middle of the 20th century to have reached. As of next year, in fact, the first broadcasts of Star Trek (the original series) will have reached all 65 of these closest exoplanets! As for the prospects of visiting any of these exoplanets in person—well, that may take a while. The closest known exoplanet, which orbits the nearest star to our solar system, Alpha Centauri, is 4.36 light years away, or 26.16 trillion miles, a distance that would take the fastest spacecraft we've ever flown almost 60,000 years to reach.